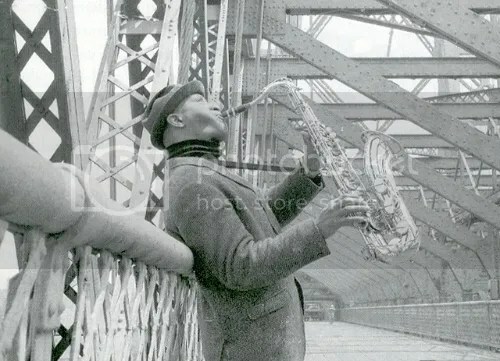 Sonny Rollins playing his saxophone on the Williamsburg Bridge. (New York Daily News Archive). This week’s article is unique to the rest of the site’s content. In this post, I have written a letter to jazz great Sonny Rollins. Mr. Rollins’ music has profoundly impacted my life since I first heard his album titled ‘The Bridge’. In order to convey my appreciation for his work, I have composed a letter for his review, which is posted below. I hope you enjoy it. My name is Aaron and I am an admirer of your work. I am 33 years old and have been listening to your music for the past eight years. During that period, I also picked up the Tenor Saxophone and started playing jazz. In fact, since I first heard your music, I have meant to write you about how your sound and craft has impacted my life. That said, I apologize for my tardiness. My experience with your music began around 2010. At that time, my Father gave me an original vinyl copy of the ‘The Bridge’. My Dad grew up playing the saxophone and became a fan of jazz musicians like Stan Getz, Gato Barbieri and of course Sonny Rollins. ‘The Bridge’ is among his favorites, and he believed that I would be equally as enthusiastic about it. At the time, I did not own a record player, nor did I understand the complexities of jazz. Rather, I had been a music fan since childhood, and was always eager to hear something new. So, my Dad let me use his record player and I dove headfirst into the album. Before listening to the record, I examined the album cover. The blue background gave a sense of infinite space, indicating the many possibilities within the recording. I surveyed the image of you with your instrument. The look in your eyes was confident and thoughtful. Your choice of clothing was sharp and expressive, with a sartorial jacket and creased slacks and demonstrative multi-colored shirt. Finally, your Selmer saxophone looked visionary, an object only possible in a dream. In fact, all aspects considered, the album cover offered my first notion of jazz: an infinite space of creativity and reflection. 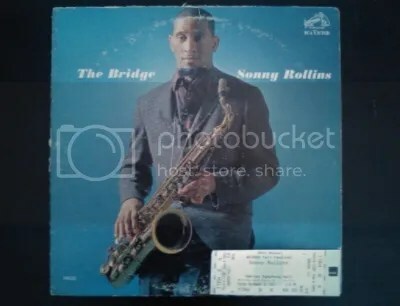 My original copy of ‘The Bridge’ by Sonny Rollins. In the lower right-hand corner is a ticket stub from a Sonny Rollins concert I attended in 2012 at the Davies Symphony Hall in San Francisco, CA. (Courtesy of Aaron Robles). With that, I powered on the record player and began to listen. It was like hearing a new language. I tried to keep up with the flurry of sound and rhythm. However, it became obvious that I was not going to understand jazz in one day, but I was intrigued by the sound. Even so, I was enamored by your rendition of God Bless the Child. Given my inexperience with jazz composition at that time, I wasn’t necessarily enthralled by your technique or musicianship. Rather, I was captivated by your sound. Truly, it was unlike any I had heard before in my life. It was distinct to my previous tonal experiences, whether from an instrument or the natural environment. There was no way to describe it. Instead, all I knew was someday I wanted to sound like that. Shortly thereafter, I bought a used Tenor Saxophone and began a curriculum of self-instruction. I fervently practiced, much to the dismay of my neighbors, fundamentals, tone and improvisation. I continue to play my horn often and though I am hardly proficient: I love every moment. Learning to play the saxophone and jazz has been a nearly perfect experience. My horn is always honest, admonishing me with discordant sounds when my form slackens. Also, playing jazz allows me to engage in a daily activity that is never the same. Each time I play, I travel down a different creative road, providing a new experience with every session. As time has passed, these gifts have proven to be invaluable. That said, I want to say thank you. Listening to ‘The Bridge’ eight years ago changed the course of my life. I am a more creative and reflective person since learning to play the saxophone and developing a love for jazz. By teaching myself to play the tenor sax, I learned a new way of communicating with the world. When I play my horn, I creatively interact with others and internally too. Also, jazz has made me a more contemplative person. As I developed my listening ability, jazz improvisation became a vehicle for conveying emotion. Listening to a solo was a chance to hear the performer’s inner-most thoughts. It provided a sense of intimacy, and consequently a chance for self-reflection. In my experience, jazz is the only music that affords such a unique opportunity for personal growth and human connection. In closing, I write this letter to convey sincere gratitude and not mere adulation. To be sure, I regularly listen to your albums and always enjoy the music. Nonetheless, I am forever grateful for the impression that ‘The Bridge’ left on me. Without a doubt, your album has made me a better person. So, thank you for possessing an artistic ability that allows personal transcendence through the simple act of listening. That is a rare gift, and I am forever indebted to you for it. For a saxophone player I know very little about Sonny. I plan to pick up a few albums soon. The few pieces that I’ve heard from him are fabulous. @Tony- He is an incredible player. His improvisation has always been a notch above everyone else to me. He always has great improv ideas and he never gets ahead of himself. If you want to hear more of his tunes, a few albums that are good to start with are Saxophone Colossus, Way of Out, Freedom Suite and Work Time. Hi Aaron. Nice piece. Besides playing, you should write about music and the musicians who play it. I think you have a knack for it. Hope all is well. And if you write a book, I’ll handle PR for you!